Our organisation is committed to offer an excellent range of Dairy & Food Processing Machinery, Pumps & Pumping Units and Homogenisers to the esteemed customers. The entire range of products is manufactured in tandem with the international quality standards by employing the sophisticated facilities. Moreover, we make use of high-grade raw material and components for fabricating these products. 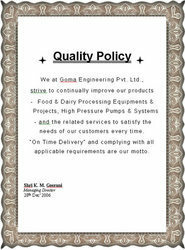 We also follow quality policy in all our business activities. Owing to its compliance to ISO 9001 standards, our products range is used to cater to the needs of different industries and sectors. We also have a team of quality controllers monitors the entire production process and other related activities to detect any kind of shortcoming. Moreover, the entire range is checked on several quality parameters by them. We always emphasise on providing a genuine quality range of Dairy & Food Processing Machinery, Pumps & Pumping Units and Homogenisers to the esteemed customers. Our customer-centric policies have helped us to become our customers' favourite. We specially train our professionals to adopt a customer-oriented approach. They make sure to offer the products that can satisfy the clients' needs in the best possible manner. The facility of customisation is also provided to the clients. We put in our efforts to deliver the ordered products at the clients' premises within the committed time frame.